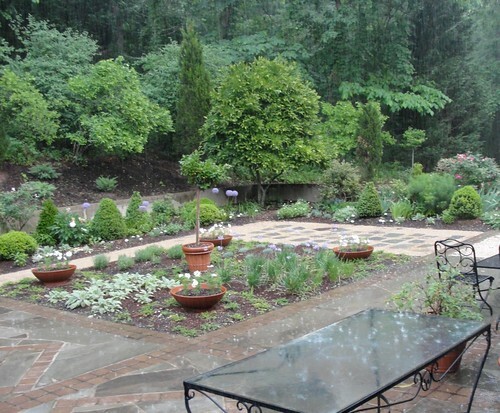 Laurelines: My big garden redo! Verbosity alert! This won't make sense if you don't read the whole thing, though, so do try and soldier on ;D.
Last November, I decided I had to do something about my garden. In 2007, my daughter Kate was married in the garden and we made it all flowery and weddingy and it really did look wonderful. What to do? 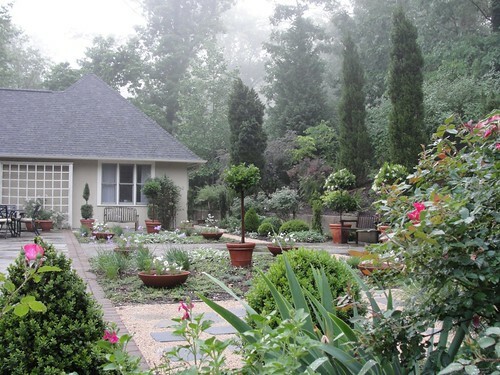 I sought and found inspiration from garden magazines and books, from some French garden designers who figured out a way to use elements from formal French gardens in a new way, a more casual and fun way. I decided to try that approach myself. I pared and pared and pared down. 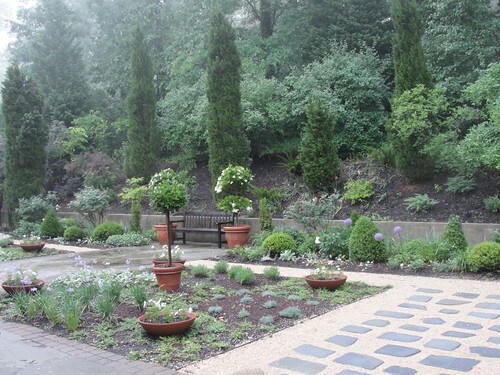 I turned my two parterres into grids, planted with an emphasis on form, foliage, and texture. 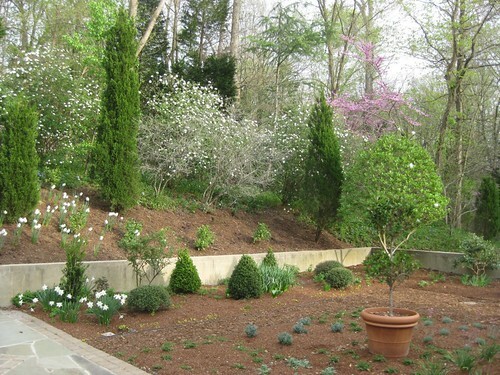 I removed lots of flowering things from my borders and added pyramidal, round, and columnar boxwoods. 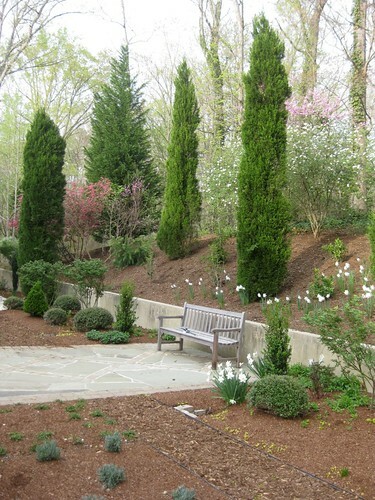 Between these, I replanted some of my old phlox, irises, roses, peonies and added alliums and other stuff---vertical, exuberant things that would play off against the evergreen topiaries. I designed a new path to replace the old mulch one, too. So, I'm back again with a new garden. There's lots of brown dirt out there, but the garden will mature, the brown dirt will recede into the past soon enough. Most wonderful of all, I'm leaving Sunday to make a pilgrimage to some gardens in Normandy, those that inspired me to redo my own garden. I'm going to sketch and sketch and take it all in and be more and more inspired, so come back and be inspired (I hope), too! See you soon! I love all your happy comments! I have gotten SO much inspiration from seeing the gardens in Normandy I came to see---I will be sure to post photos and sketches from my garden as it develops over the next year. Thanks for taking time to respond to what I'm working on! Wow! I am amazed at your bravery for tackling the editing process in your garden! Thanks for a demo of how to push through with a vision and here is to gentle rains and sun in the right spots and amounts. You've made some incredible work on this garden!! I'm impressed! Great news also about these garden sketches to come! Enjoy your trip! It looks lovely-a nice place to go to to read or paint.